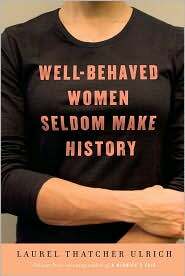 Laurel Thatcher Ulrich reads from her recent book, Well-Behaved Women Seldom Make History , in this episode of the Making History Podcast. She offers selections from the Introduction as well as examples of Amazons and other female warriors. Following her reading, Ulrich discusses the challenges of writing a book that surveys a wide swath of history. Coming next week in the second part of this interview, Laurel speaks about the field of women’s history, offers advice on choosing a dissertation topic, and discusses her writing of A Midwife’s Tale . This entry was posted in podcast and tagged AHA, Laurel Thatcher Ulrich, podcast, women's history, world history. Bookmark the permalink.